A few months ago, due to extreme rainfall and strong winds, around 150 houses were damaged or destroyed in the village of Vajarahalli, Hunsur district. The Infomediary from the community information centre went to every house and took pictures of the parts that were damaged. She documented this and encouraged the villagers to submit applications for compensation. She met with the Panchayat Development Officer and Panchayat members, who then visited all the damaged houses and heard from the villagers. 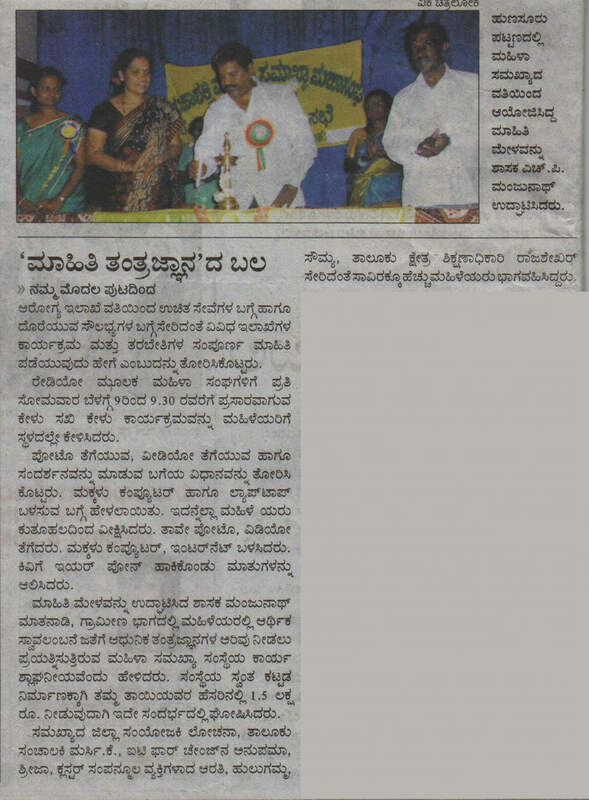 In order to inform women about different Information Communication Technologies (ICTs) and showcase women who have already used technology, an Info-mela was held in Hunsur on July 5th, 2014. All Mahila Samakhya women from Hunsur attended the mela. 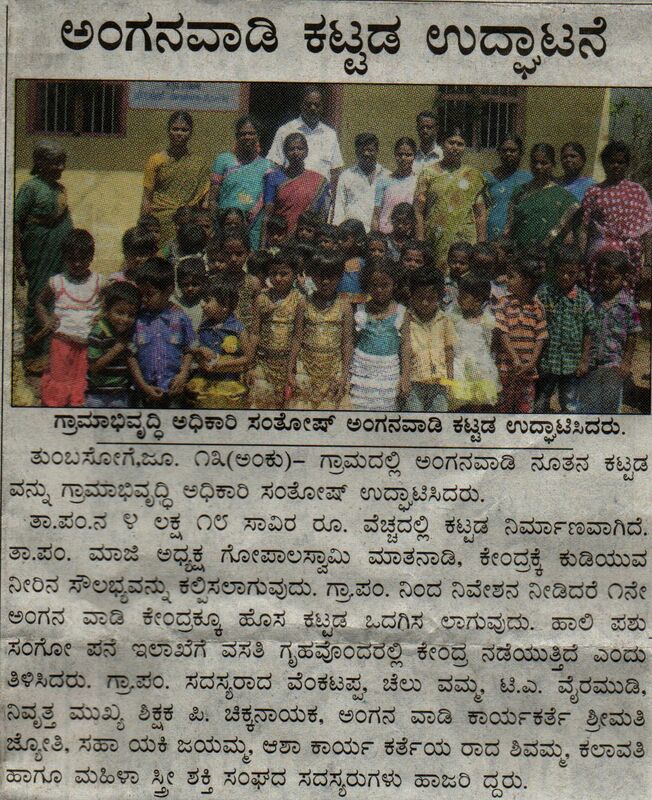 IT for Change has been working with the Chandapura Panchayat in H.D.Kote block for several years now. The Panchayat Development Officer (PDO) agreed to our suggestion that an all-women village assembly be held, where women from the community are able to interact with local authorities (i.e. This week's story is about Hemant bhai, a labourer from Ambipur village, Sonapur cluster. The sangha women (women's collective) of Bidiadi village approached the Rathnapuri Public Health Centre (PHC) Doctor to conduct blood grouping for women and adolescent girls of Vajarahalli. The PHC doctor was kind and accepted their request. After the procedural formalities with the department of health, the PHC Doctor mobilised the reagents, disposable needles, cotton swab, microscopic slides and suggested that the women organise themselves for the programme on 17th June. This week's story from IT for Change (ITfC) explores the importance and scope of Geographic Information System (GIS) mapping in our work. The ITfC team used GIS to map toilets, drainage, drinking water facilities and street lights in Chandapura Panchayat. With the support of the Panchayat Development Officer and the local Child Care Centre worker, the data was collected and presented at the panchayat meeting on 2nd June. The information centre in Devnagar is also the space for the Nyay Samiti (committee of infomediaries, village leaders and ex-Elected Women Representatives), which takes up issues related to gender, primarily involving domestic violence. It provides counselling and support to families facing these issues. The Elected Women Representatives' (EWR) core group met on 5th May at the ANANDI information centre. During this meeting, 2 women shared that they were being paid only Rs.50 for an entire day's labour. During an outreach visit to 2 villages, the infomediary, Gauri, from the Hunsur block information centre, informed sangha women (women's collective) about the need for regular health check-ups. Through the use of audio-visual aid, she explained the benefits of getting blood tests and scans. As a result of this, 21 sangha women from Devanahalli and Gopaharli villages went to the Public Health Centre and got tested. It is evident that the infomediary plays a crucial role in assisting villagers avail benefits.